From Just Nan, this buzzy bee is decorated with sweet pink flowers and glittering gauzy wings and is an ornament and pinkeep all in one! 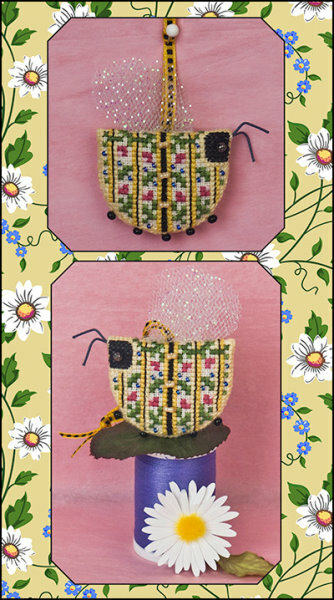 This Limited Edition kit includes blue iris beads, yellow peanut beads, 2 black metal eye beads, glitter tulle for the wings, bee ribbon for the hanger and wire for his antennae (The pins along the bottom edge are not included, nor is the 3" X 2" piece of fleece batting.) Barnabee is stitched on 32ct Cream Belfast Linen using DMC floss. Design area is 3" X 2", and he measures just 1 ½" X 1 ¾" without his wings.